Taare Zameen Par-famed actor Darsheel Safary is in Guwahati to take part in the first Guwahati International Children Film Festival inaugurated by Chief Minister Sarbananda Sonowal on Saturday. This is the 21-year-old’s third visit to Guwahati. The festival is organized by Jyoti Chitraban in association with Dr Bhupen Hazarika Regional Government Film and Television Institute at Srimanta Sankardev Kalakshetra from 19–21 January. A total of 50 children films from 23 countries will be screened and there will be a special screening of Santosh Shivan’s noted film ‘Hello’. The festival will be screened through satellite at Dhubri, Charaideo, Silchar, Sadiya, Bongaigaon and Dhemaji. 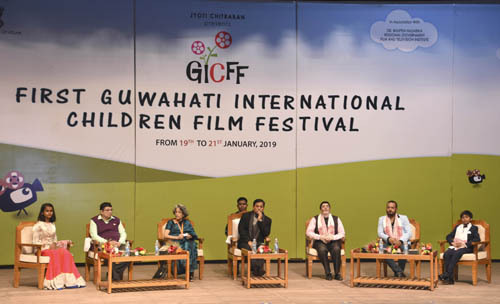 Addressing the gathering Sonowal said that the children film festival held for the first time in the state will inspire the young generation to make meaningful contribution to the society by becoming able citizens, Sonowal urged the children to utilise the knowledge acquired from the films in shaping their lives. Chairman of Jyoti Chitraban Pabitra Margherita gave the welcome address while the Director of the festival Manita Borgohain explained the details of the event. Child artiste Tathastu, who starred in the film ‘Halka’ which was the opening film of the festival, also shared his experiences and spoke about his visit to Assam. Chairman of Assam State Film (Finance and Development) Corporation Ltd Jatin Bora, Commissioner and Secretary of Cultural Affairs Department Pritom Saikia, noted filmmaker Santwana Bordoloi, child actor Bhanita Das of Village Rockstars fame were also present on the occasion among others.